I just put up a (self-published, I know) novella available for sale on Amazon. While ostensibly a hard-boiled 1930s noir, it is more parody and comedy than anything else, and if it does well, the first in an open-ended series (as in, it isn't a trilogy or anything, but I can keep releasing new cases). 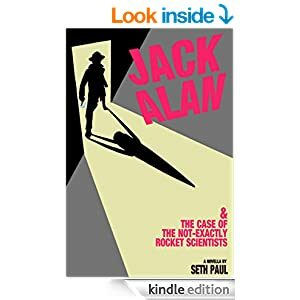 Jack Alan is a mostly sane but cynical private eye in a crazy world, and in his latest case, he's been asked to locate a missing rocket scientist. Trouble is, he's not the only one looking for him, and he has to deal with government bureaucrats, mysterious agents, and a few other surprises, all while making sure the bullet wound he got from a previous case doesn't get any worse. Quick Edit: There actually IS a cover for the book, but it refuses to show in Amazon searches. It's been up since Day 1, but I've heard self-published materials can be troublesome and glitchy when it comes to the cover. It does show up when sold, and when looking at the sample by clicking the "Picture Not Available" button. I've uploaded the picture twice and have heard that if it finally shows up at all, it could take up to three weeks to display properly. Well believe me, I calculated the odds of this succeeding versus the odds I was doing something incredibly stupid... and I went ahead anyway. I have a sequel in the works. It's not finished, but it'll probably be ready by spring/early summer. It's tentatively called, "Jack Alan and the Case of the Fatal Curse of Deadliness," and it will involve a murder in the newest exhibit of the Museum of Relatively Natural History...and a curse. A fatal curse. Possibly of deadliness. Well, as a bonus, I'm running a "99 cent" sale on the ebook next week as a "birthday special." From March 9th to the 16th, it'll be less than a dollar. If you haven't got it yet, this'll probably be the best time to do it! Progress on the second novella has been slow, but it is still in the works. However, I'm hoping that in September I will have a print copy of the first book available. Also, I had entered a short Jack Alan story I had written for a contest. It didn't place, but I think the story will be good for either an addendum to the end of the second book, or good for a collection of shorter stories to be published at a later date. And although this isn't Jack Alan-related, I have also finished the first of a two part fantasy story. I have a lot of editing to do on it (not the least of which is coming up with a title, which is usually the hardest part), but in its current state it's 162,000 words in length. That one I'm planning on submitting to a publisher once it's in-shape, but that may take awhile. I have a Jack Alan short story that I sent in for a Narrative contest that didn't make the finals, but I think would be good to include sometime soon, either as part of a short story collection or as a little "add-on" to another Jack Alan story. If you have read the first book, is this something that would be of interest, or if you haven't, would you consider it a nice little bonus to be of interest to buying either book?